Depending on the source, Emmeline Pankhurst was born 160 years ago today (or the 15th.). Emmeline and her husband were active British suffragists. 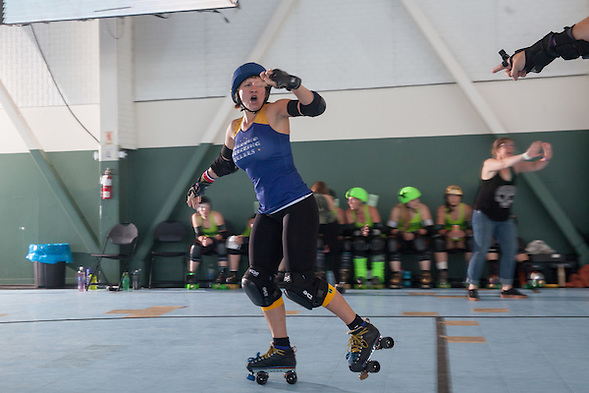 During this year’s Golden Bowl in Oakland, California, I recalled Pankhurst’s famous quote while photographing the roller derby bouts at the Bay Area Derby warehouse. 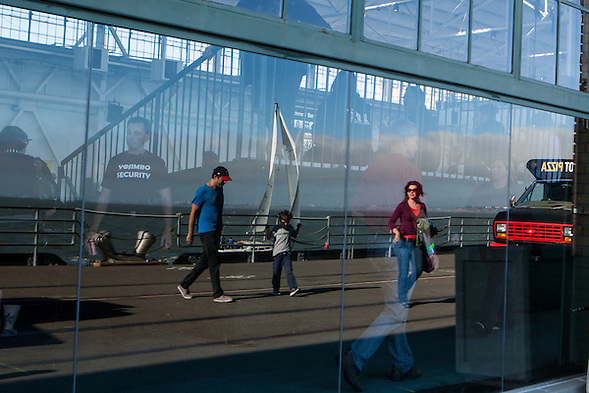 Many of my pictures have broken windows in the background. Other pictures have the Golden Rules poster in the background. 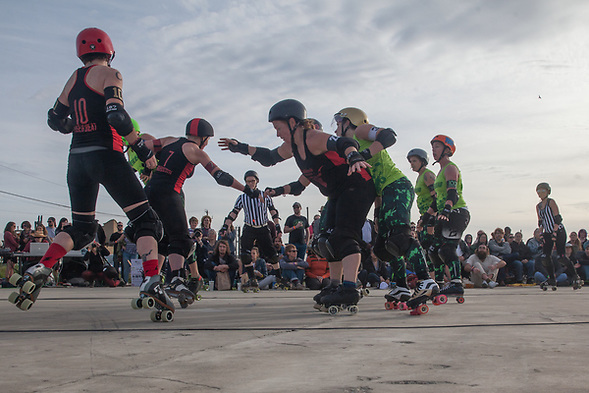 The 2018 Bay Area Derby roller derby season started this Spring with two bouts at San Francisco’s Palace of Fine Arts. I photographed a bout in March and another in April. 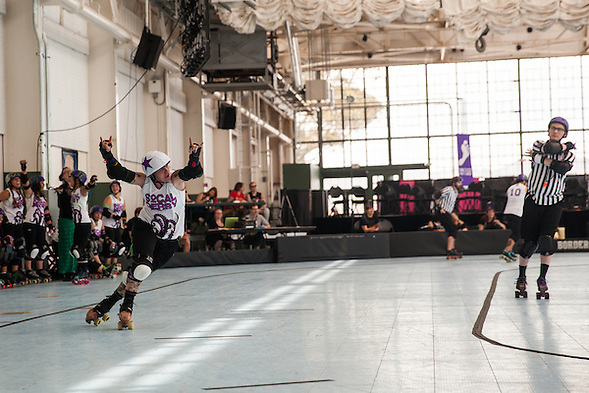 This is the first season that Bay Area Derby has skated at the Palace of Fine Arts. BAD changed their teams, uniforms, and regular season home. 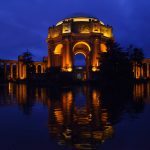 The Palace of Fine Arts was originally built for the 1915 World’s Fair. 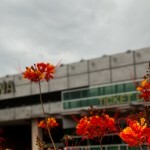 It is one of the few remaining structures; it is definitely the most recognizable. 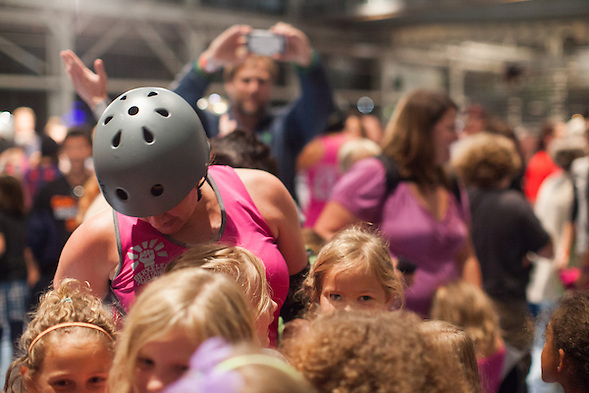 I have been photographing roller derby since 2011. 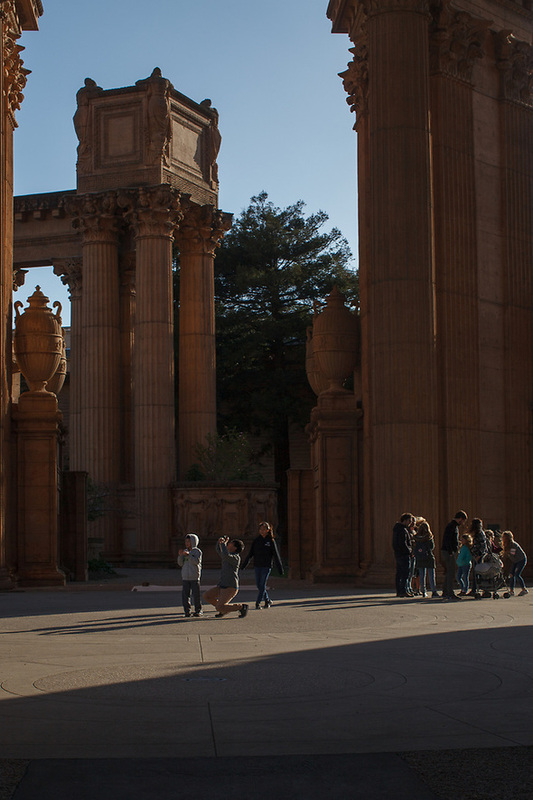 Sometimes I wonder if I have been doing this too long, but I felt younger next to some of the structures at the Palace of Fine Arts. 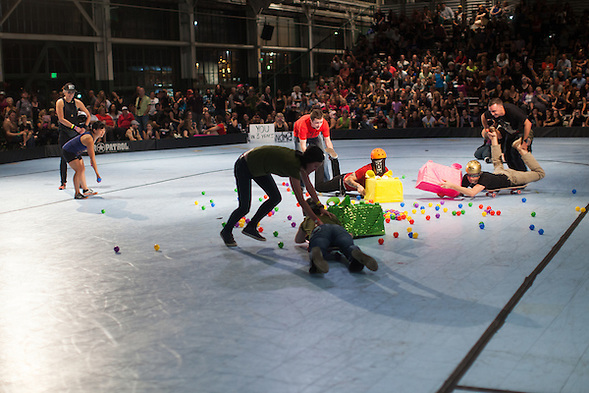 On Saturday, two teams skated in circles and one team would be able to hold a trophy at the end of the bout. Last year the Berkeley Resistance won. This year they won again. 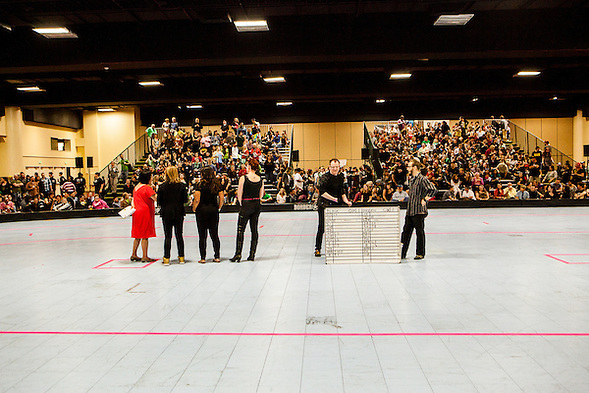 So, walk this way and view the two galleries from #BADchamps2016. I recommend that you play a Gene Wilder movie in the background. 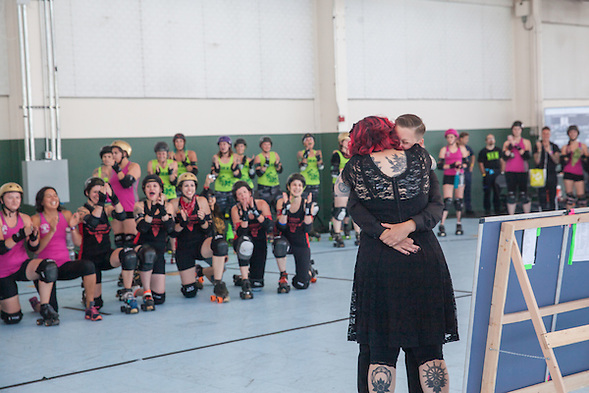 I almost did not photograph last weekend’s Bay Area Derby Pride double header. I would have missed something special. 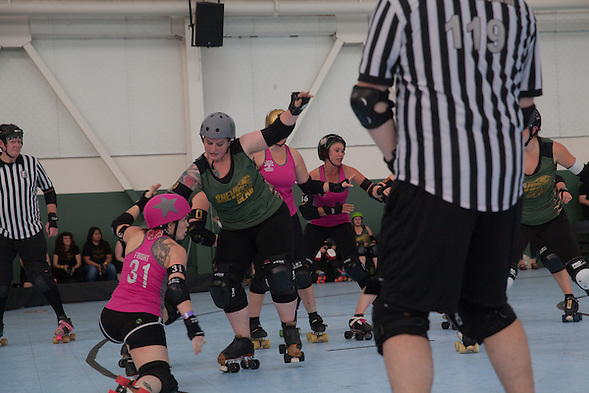 My derby photographs were not special, although I took a few decent action pictures somehow. 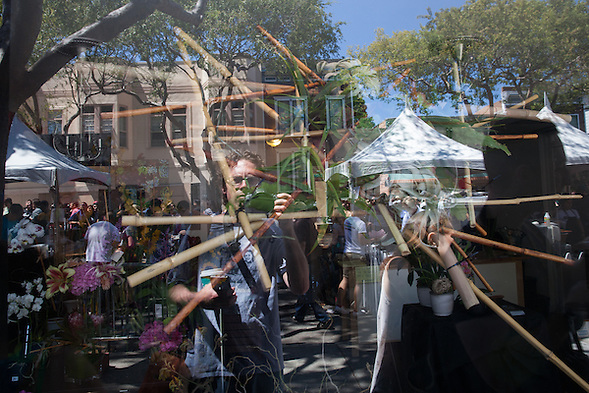 There are two slideshows below the next two photographs. 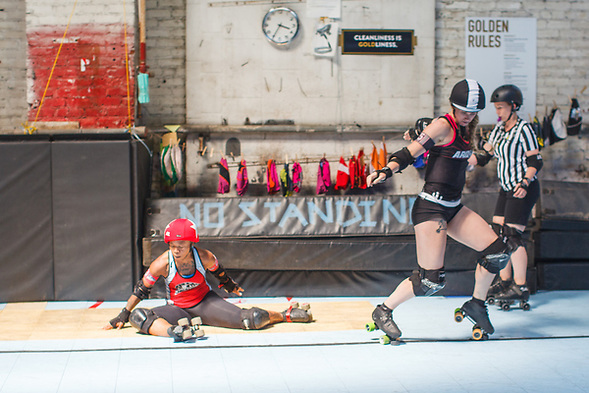 In the second bout, Richmond Wrecking Belles defeated the San Francisco ShEvil Dead. 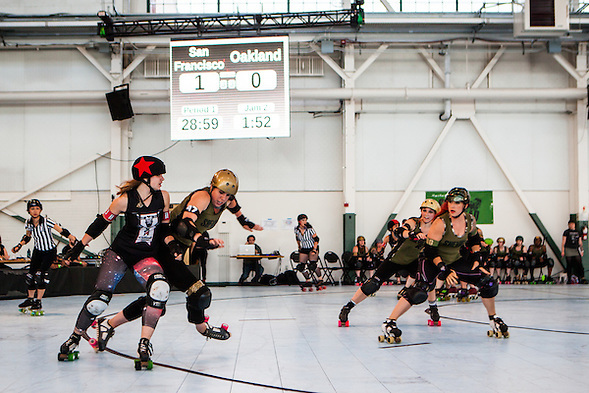 In the first bout, the Berkeley Resistance lost to the Oakland Outlaws. A former skater coached the winning Oakland team, and an injured skater coached the other winning team. 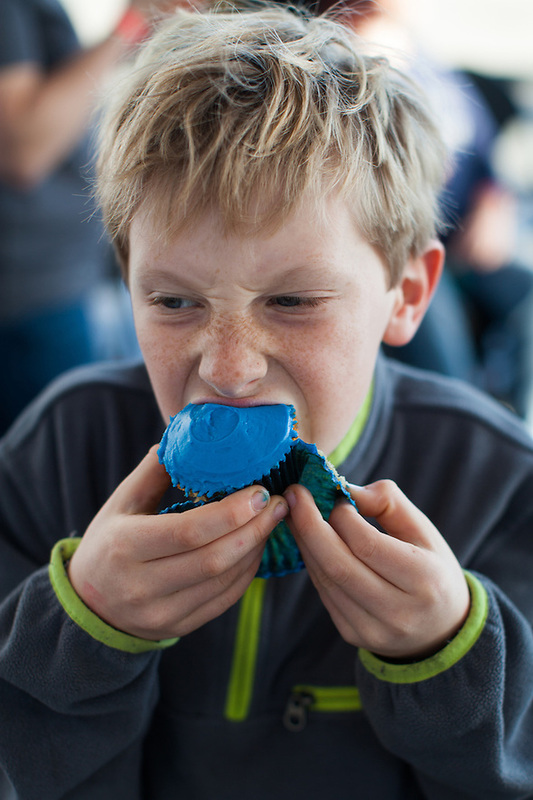 Two contestants won the rainbow whip cream eating contest. The bearded man was one of the winners. I have pictures to prove it. After the first bout, the skaters gathered while a referee was honored. Then the rest of us were honored to be in the presence of something special. 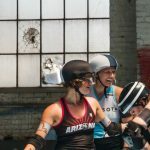 I am a roller derby photographer and my 2016 season started last Saturday. 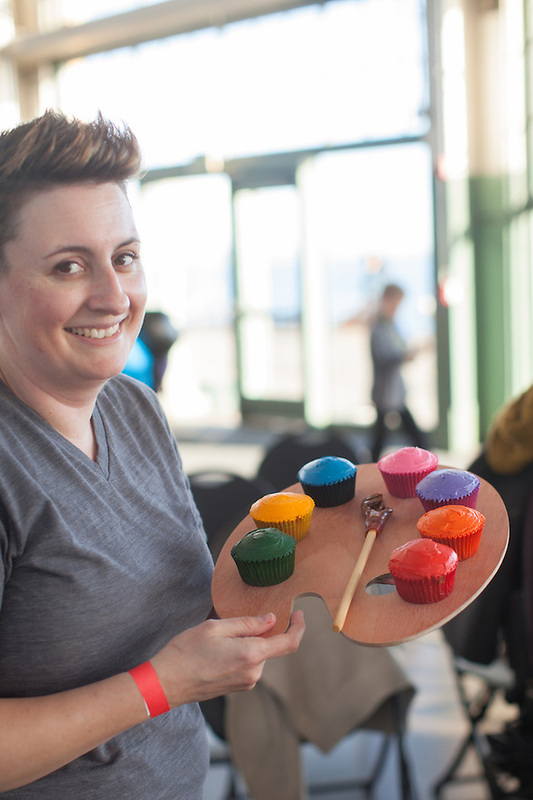 I usually photograph at The Craneway Pavilion in Richmond, California where light imitates art … or art imitates cupcakes. I forget. I posted one gallery of the two evening bouts here. Before the evening bouts, I took my children to the Rosie the Riveter WWII Home Front National Historical Park. We would have watched the junior derby “Golden Goblet” earlier in the day, but my son played his first baseball game Saturday and my daughter danced earlier that morning. Last week I met sports journalist Justine Gubar. She wrote the book “Fanaticus, Mischief and Madness in the Modern Sports Fan.” The book is about crazy fans. Last night I watched the Major League Baseball playoffs. Toronto fans threw beer cans and other debris onto to the field after being upset with an umpire’s call (but mostly the fans hit other fans, including kids). Toronto eventually won, otherwise the fans might have thrown kids. 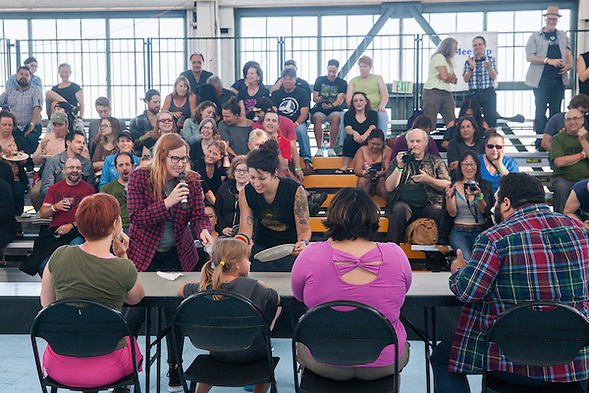 Last weekend, I photographed the Bay Area Derby Girl roller derby league championships. Some fans cheered. Some drank beer. 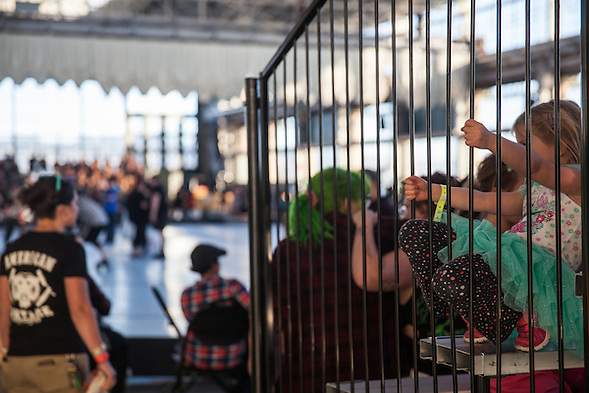 Some fans brought their kids (or some kids brought their parents), but nothing unusual happened… except that The Berkeley Resistance won their first league title. You can view more photos of Berkeley’s first league celebration and 161-143 victory over Oakland at the gallery here. 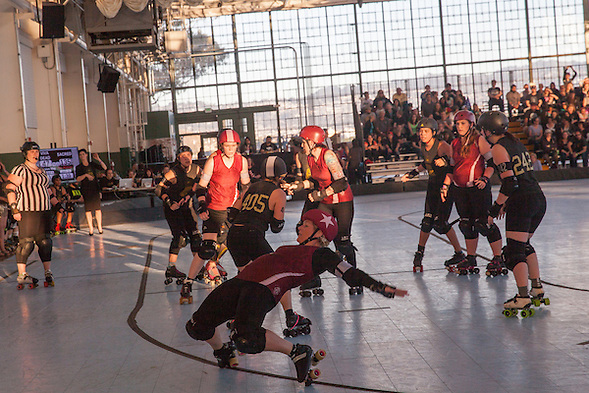 You can also view the third place gallery between The Richmond Wrecking Belles and The San Francisco ShEvil Dead. 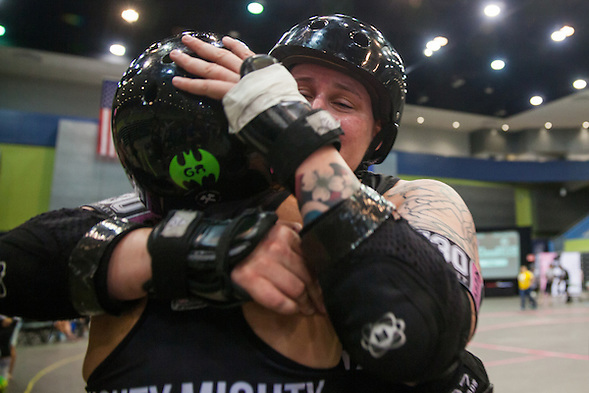 I almost did not attend the 2015 D1 WFTDA International Roller Derby Tournament in Tucson, Arizona last weekend. 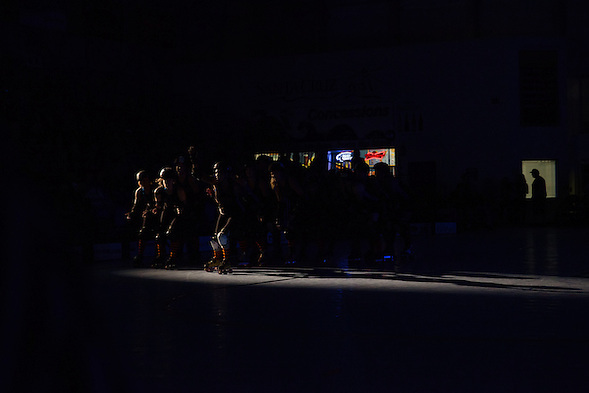 Even though I love roller derby, I was scared. At the beginning of September I visited my neurologist after listening to another Oliver Sacks interview. I suspected that I had prosopagnosia (face blindness). 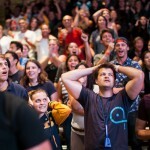 I thought that I was losing my mind and I was afraid to spend three days in the desert meeting (and re-meeting) people, but I couldn’t let my fear stop me. This post might turn out like my dinner tonight. I grilled a cheese sandwich with turkey, garden tomatoes and avocado. The sprouted bread fell apart, the crust became hard and the inside became mushy and cheesy. It tasted good, but I would not serve it to friends. While I rushed my dinner, I have spent several days trying to write this blog post. I have yet to digest my emotions from last Saturday. 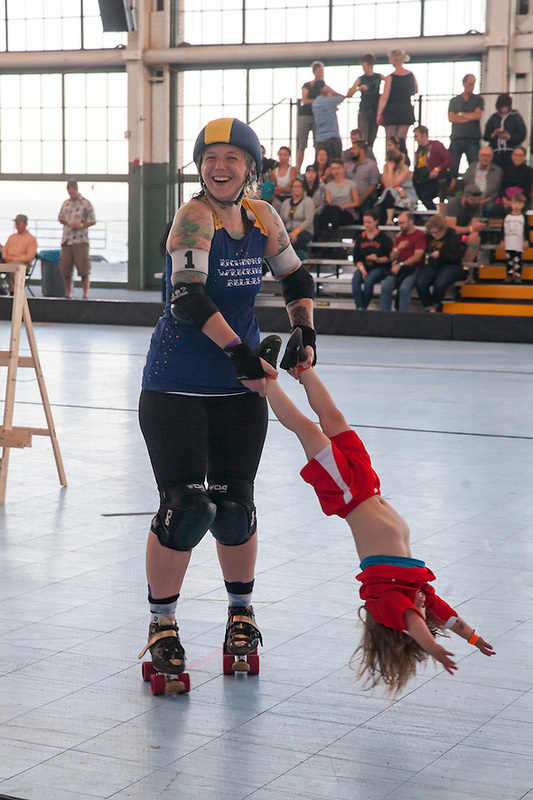 Before I attended Saturday’s bout between the Santa Cruz Derby Girls Bombshells and the Bay Area Derby Girls Team Gold, I planned a simple post that included galleries from two previous bouts. 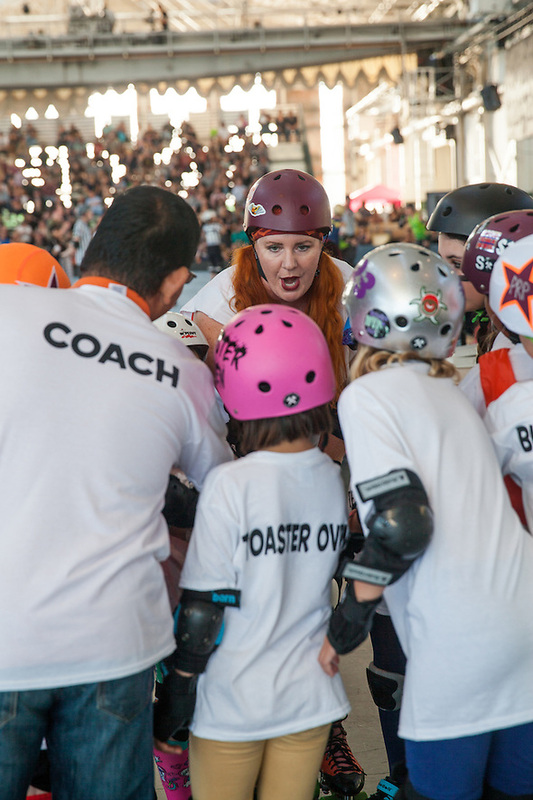 I would discuss the community based organizations that the roller derby teams supported at recent events and I would mention how my children love attending roller derby too. Then I met Bryan Stow. 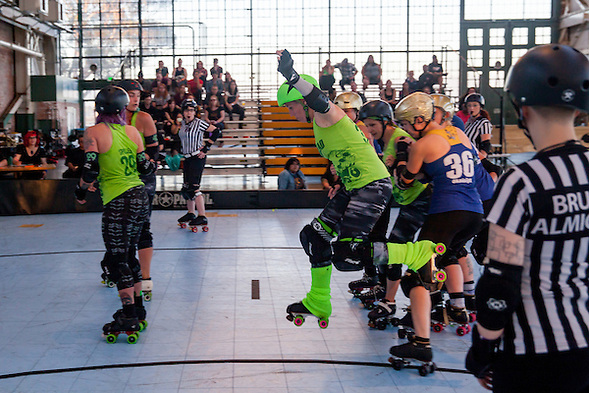 The Bay Area Derby Girls opened the 2015 regular season on International Pi Day. 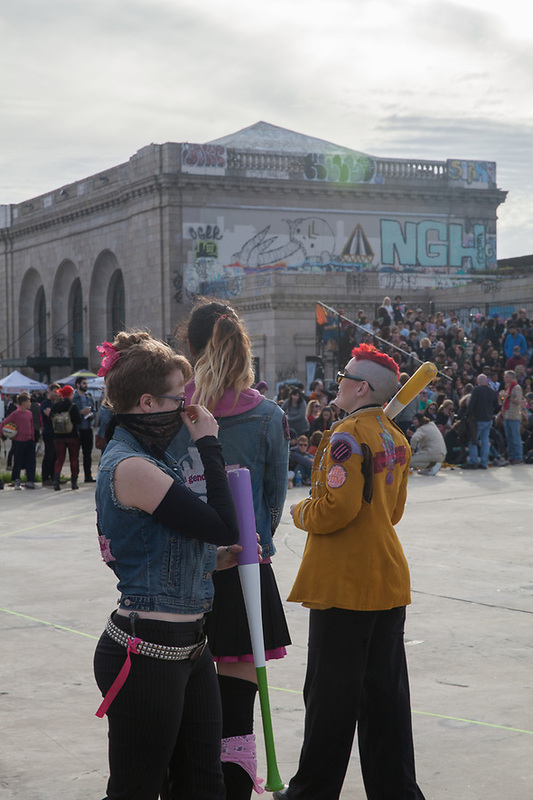 Berkeley won the first bout against San Francisco (photo gallery here), and Oakland defeated Richmond in the second bout. (photos here.) 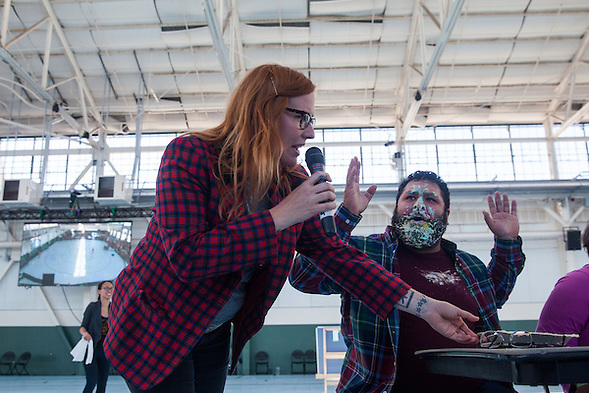 Four people competed in a pie eating contest, which the audience won. The derby and sunset were grand, as was the marching band. I searched for circles. Pi Day is a real thing. In case you forgot the formula for measuring the area of a circle or cylinder, you can find it on the page International Pi Day page. I learned the origin of the joke that “Pies aren’t square; they are round.” I also learned that there was a such a thing as a Pi joke. 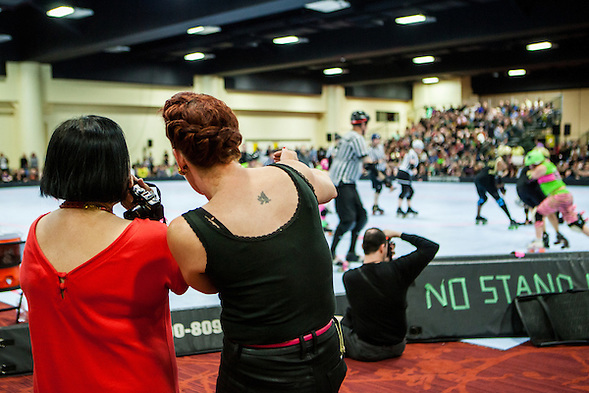 Last weekend I photographed the Santa Cruz Bombshells’ final bout of the season. 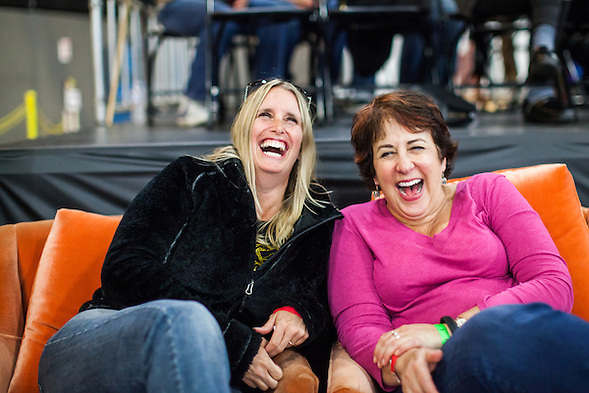 Santa Cruz hosted the New York Bad Apples at the Kaiser Permanente Arena. 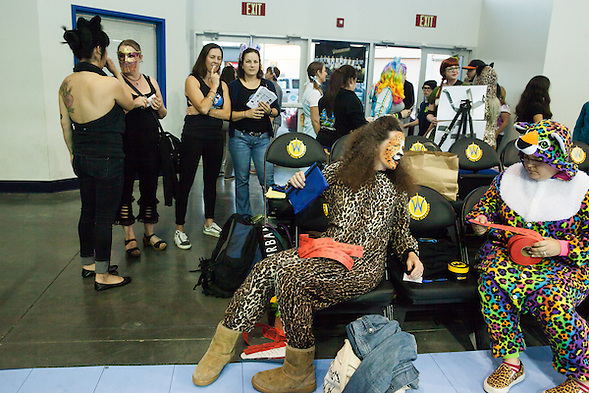 Because the bout was held in October, there was a costume theme. 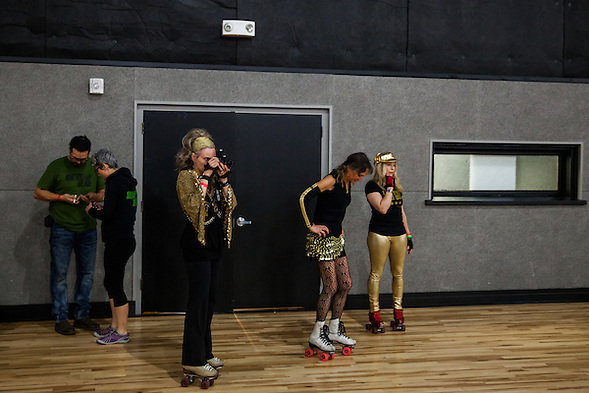 Because this was roller derby, a costume theme seemed a little redundant… until I participated. 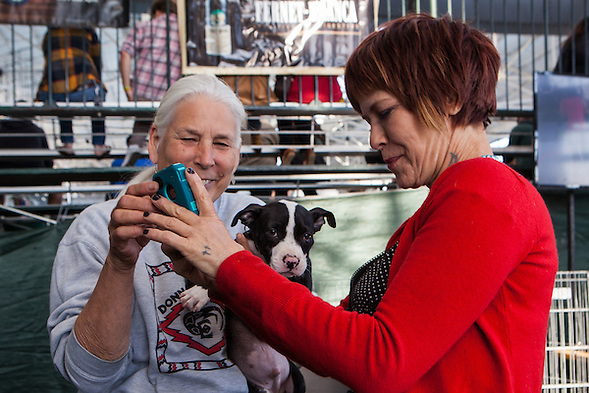 Almost every roller derby skater and official adopt a persona and name. I have a derby name, (it’s P Giddy), but I have not really lived up to it. I wondered if a costume theme would negate personas. Would some people dress as normal people? What is a normal person? Am I a normal person? Instead, it was double fun. Last Saturday, the B.A.D. 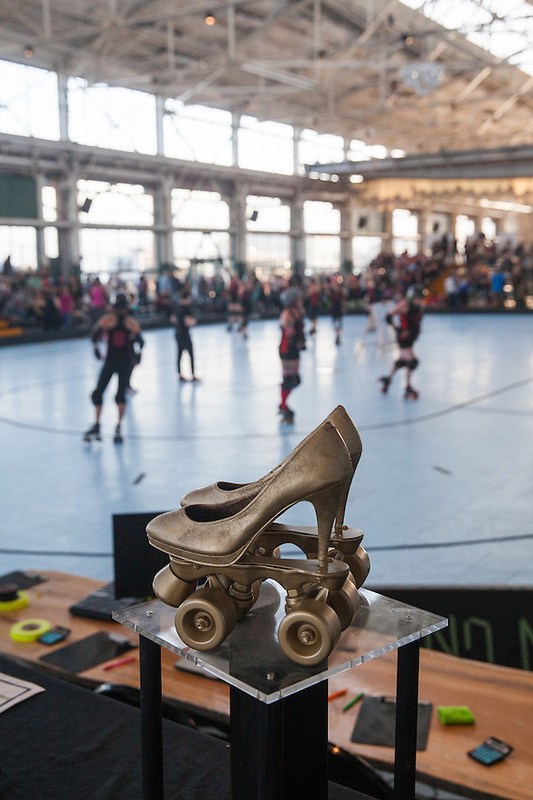 Girls held their 2014 women’s flat track roller derby regular season championship. 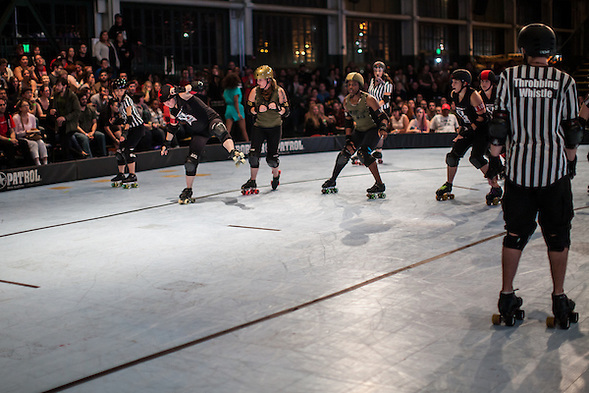 Roller derby has become a popular sport throughout the world. B.A.D. 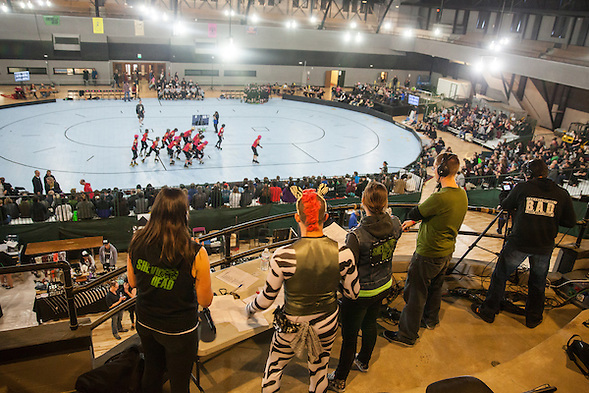 is one of the top leagues in the Women’s Flat Track Derby Association, or WFTDA. 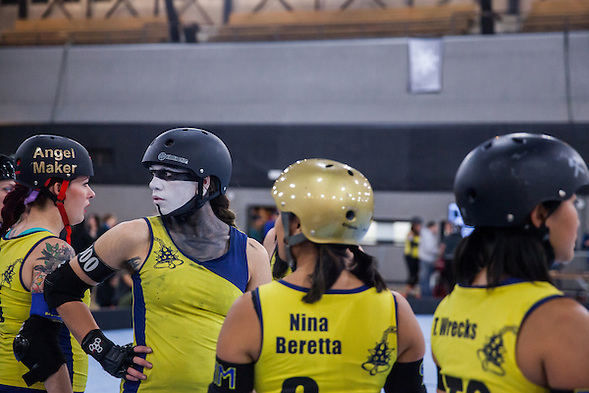 The WFTDA lists leagues on their website. 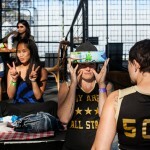 I am an official photographer for the Bay Area Derby Girls. I really do not know why I don’t smile more often. After bouts, I post photos to my photo site (www.AflatTrackMind.com and to my little facebook site). I write blog posts here. I am going to write less this time and just post links and photos. So, today is the 10 year anniversary of the day my father committed suicide. I was going to write a very dramatic blog post about how tragedy has visited my life too often and my life was unfair, but a funny thing happened on the way to this ten year anniversary. I started to see my life differently. If life is unfair, I have the advantage, at least for today. 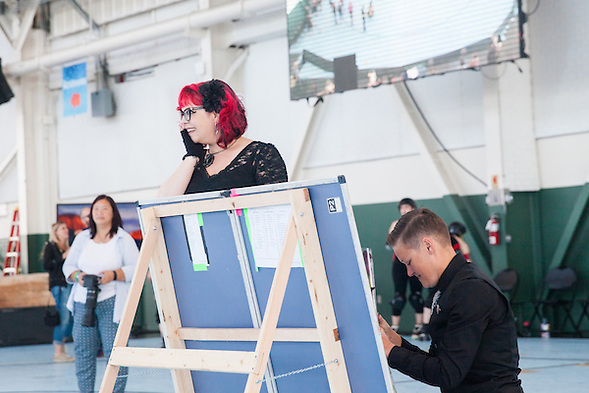 I first published this blog post on Saturday July 19, 2014, one week after the Bay Area Derby Girls regular season double header at The Craneway Pavilion in Richmond, California. 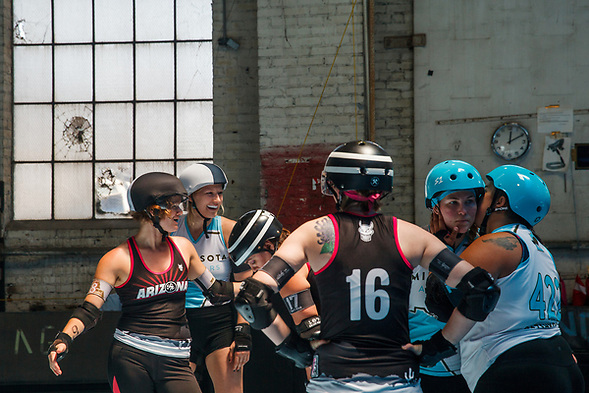 The bouts decided which teams will skate for the regular season title on August 23, 2014. You can see the entire photo gallery here. I chose photos that highlighted the work of the officials. I liked the idea of my post, but my words bored me. 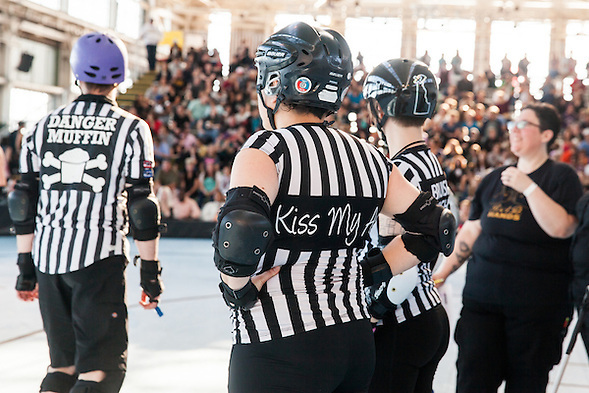 I wanted to say something better to honor the contributions of derby officials. I do not know if my edits will improve the article, but at least I can think about how I can express myself better for the next time. 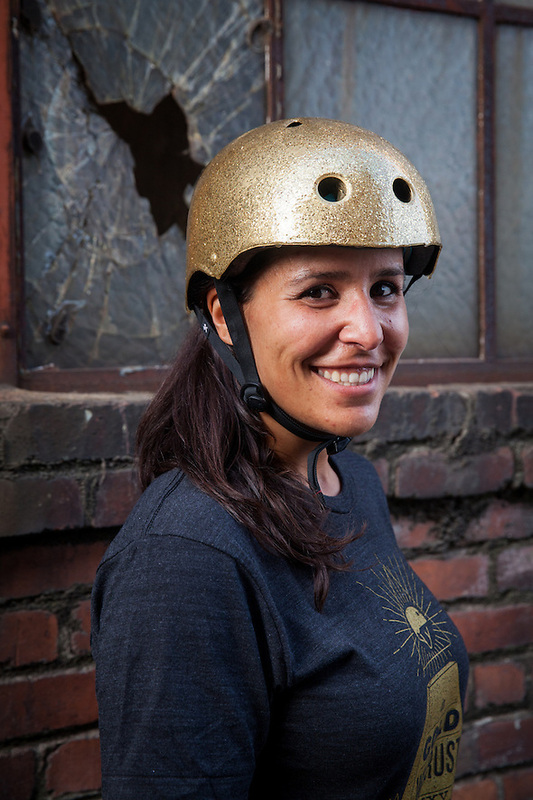 When the schedule for the 2014 Golden Bowl roller derby tournament was released, I was excited. 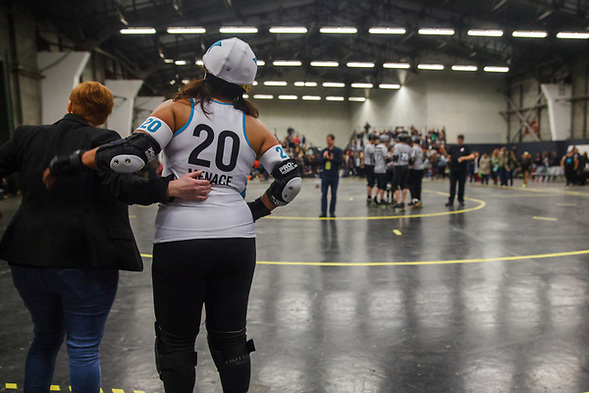 Four top WFTDA teams would compete at a Bay Area venue that provides great photo opportunities. 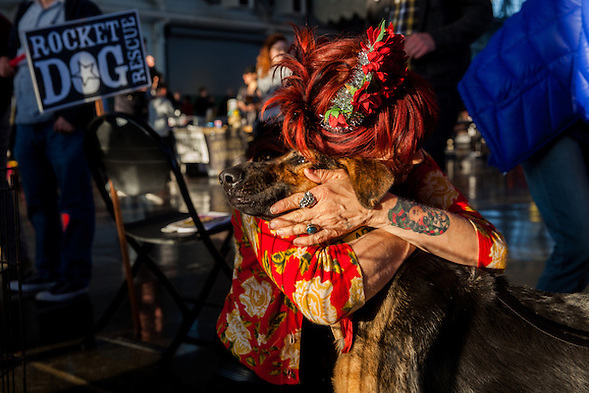 I would celebrate the end of the school year by photographing the Windy City Rollers, the Hollywood Scarlets, the San Diego SoCal team, and the local Golden Girls. I forgot about Father’s Day. Today, April 29, is my childhood friend Steve’s birthday. We met in second grade. Today is also Uma Thurman’s birthday. If you read my post about Bout 1, you realized that I quoted Mia Wallace, Uma Thurman’s Pulp Fiction character. I am not sure if I am old or if I have a good memory. Pulp Fiction was in theaters in 1994. 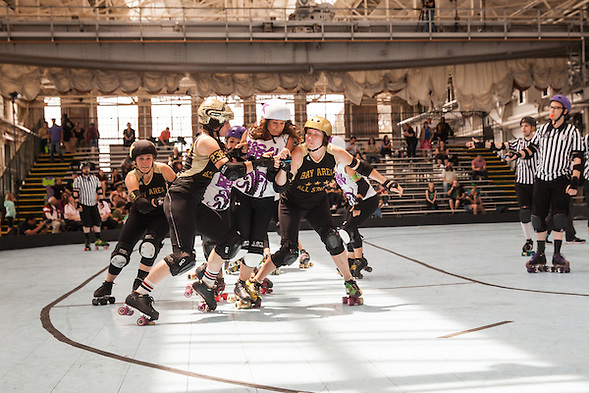 The B.ay A.rea D.erby G.irls held their second Double Header of the 2014 home season in San Francisco at The Armory on Saturday, April 26, 2014. 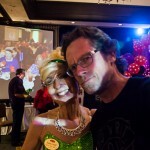 I posted a few photos on my Facebook page already, but the images look better on my derby photography website. I almost always upload galleries at www.AFlatTrackMind.com after a bout. There is a gallery for bout 1. You just need to keep reading. This was my first time shooting at The Armory. (This was my first time inside the building ever.) 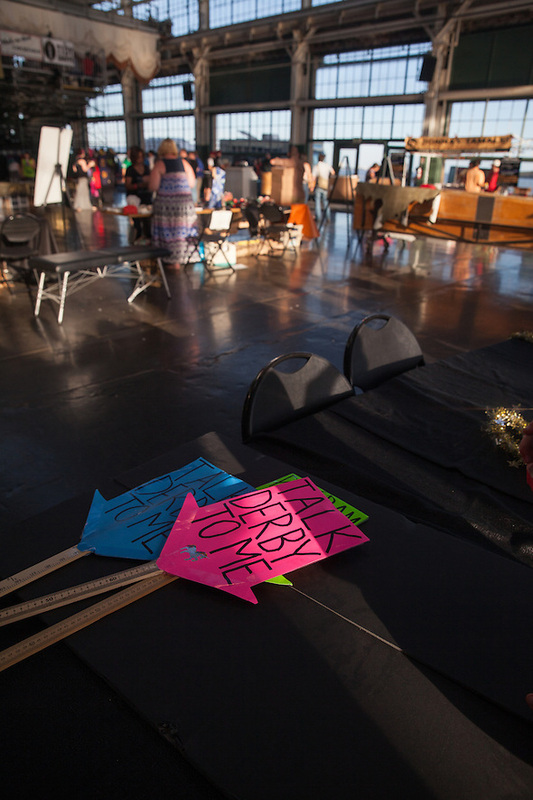 For part of the evening, I almost lived up to my really cool derby name. (P Giddy) I smiled a little more often than usual. I met new people who can teach me how to smile even better. I saw familiar friendly faces too. You can probably see familiar faces in the gallery. You need to keep looking. On Saturday March 1, I attended two season openers. One was a campaign and the other was a sporting event. There is probably a cheap joke here, but neither event felt cheap. 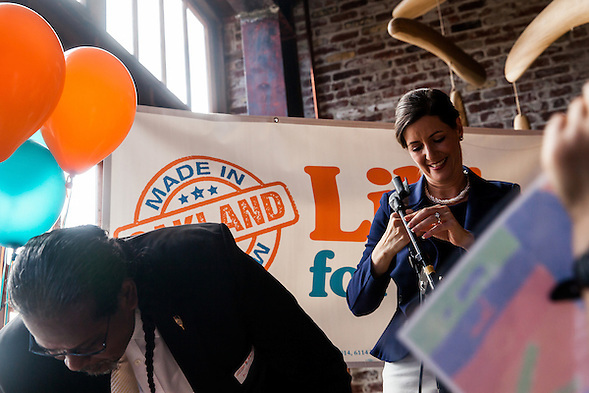 In the morning, I attended Libby Schaaf’s “Libby for Mayor Oakland Campaign Kickoff.” (I took a few hundred pictures; here is the edited photo gallery.) 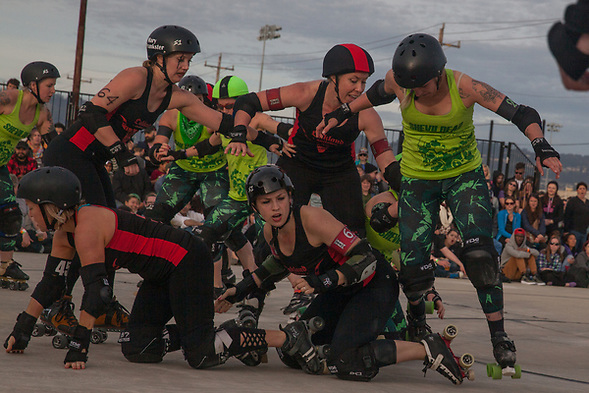 In the evening, I photographed the Bay Area Derby Girls Season Opener. The events felt similar. There was music. There were people from different ages and backgrounds. Young people held signs. Older people cheered. Everyone seemed committed. Positive. As someone who pretends to be a journalist, I do not officially endorse anyone, but I support many people and causes. I support Libby. 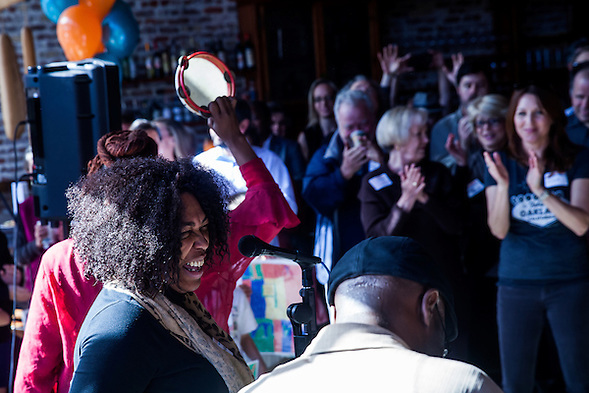 Before she was elected to City Council, she supported my kids and neighbors. I support people who help my kids and neighbors. When I review my photos at the end of each year, I am always surprised. How did I get so lucky? Yesterday I recalled meeting track legend Tommie Smith. 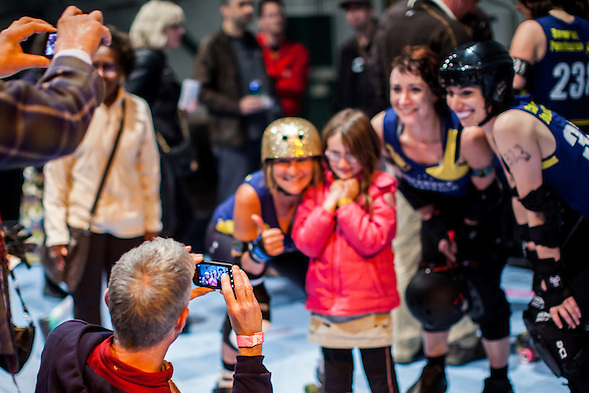 Today I am overwhelmed that I photograph women’s flat track roller derby for the B.ay A.rea D.erby Girls. 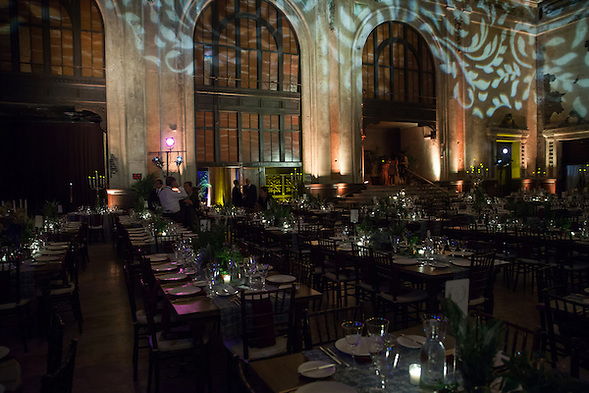 HERE IS THE 2013 GALLERY. The league has four regular season teams and one traveling all-star team. 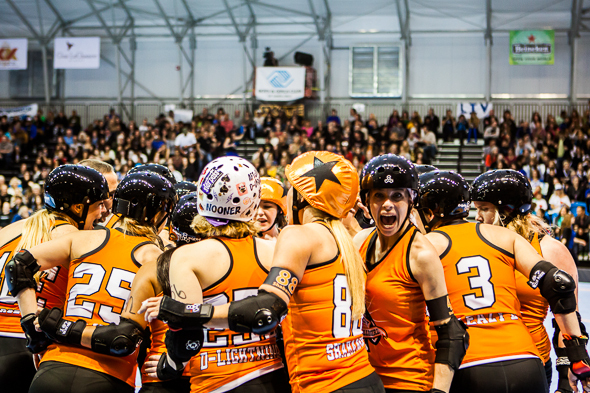 The Golden Girls, the BAD Girls all-star team, are ranked second by the WFTDA, as of November 30, 2013. 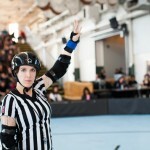 BAD finished 3rd at last month’s WFTDA Championships. I photographed most of the BAD Girl local bouts. 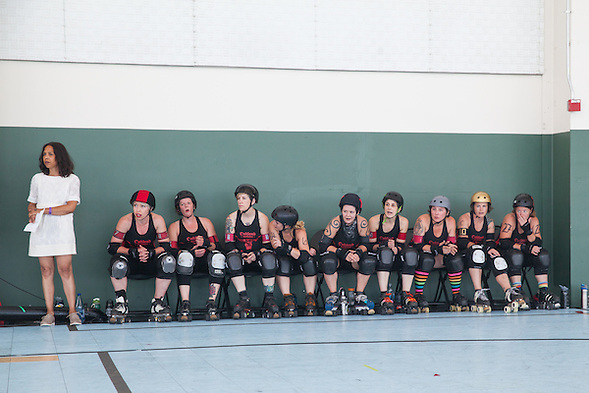 I also traveled to Santa Cruz when the Santa Cruz Derby Girls opened their new downtown facility. My wife and children came with me. 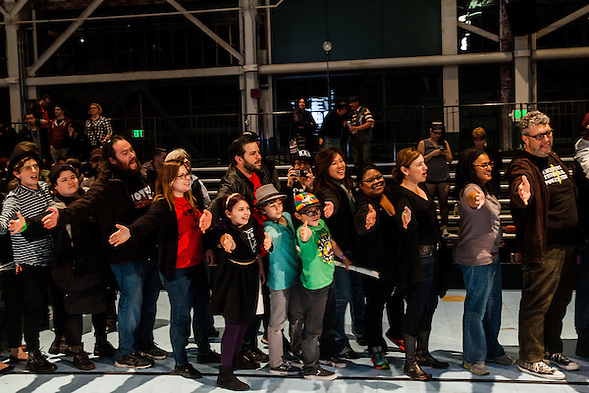 Our friends from Monterey met us at the arena with their two children. 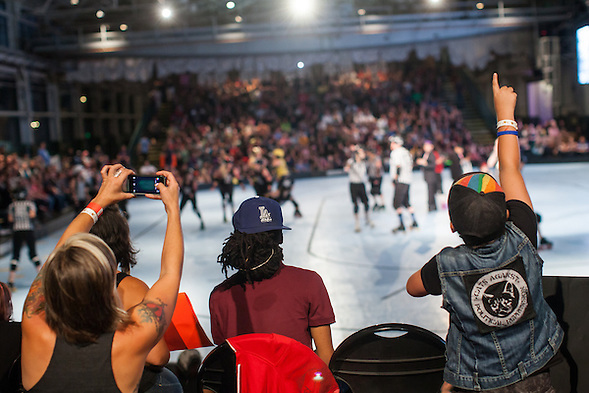 Saturday night I photographed the 2013 Bay Area Derby Girls Roller Derby Championships. I am almost a regular. I will probably always feel awkward referring to a grown woman as a “girl,” but derby is a place where awkwardness is normal. I might never live up to my derby photographer name either. I may never grow into P Giddy the way that Ellen Page’s character grew into her character, but she was a real derby girl. 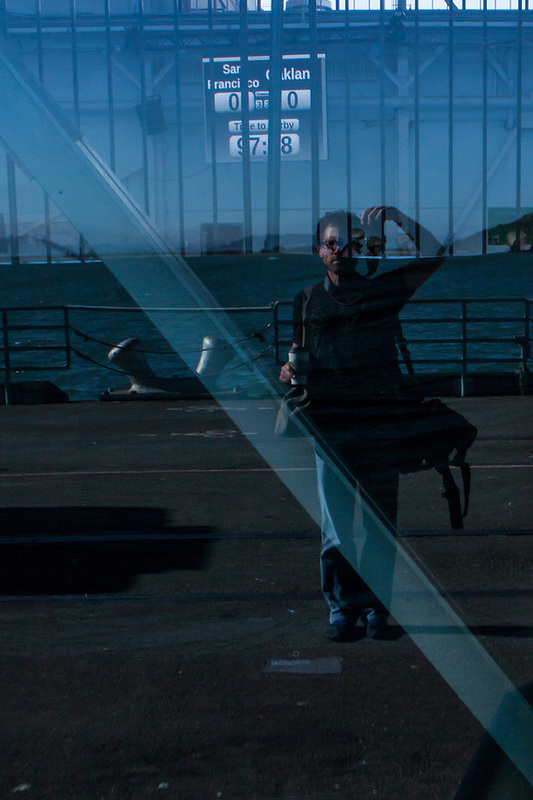 I am just a photographer… with A Flat Track Mind. See more galleries at the link or click on a picture above to launch a gallery. 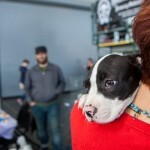 I visited the Rocket Dog Rescue booth several times during the night and each time I felt better. I also noticed when I was reviewing my photos that I took the long way around the track so that I would walk by their booth. 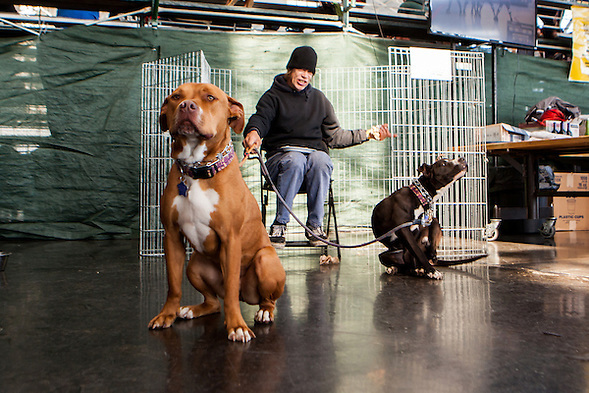 After a few minutes shooting derby, I missed the dogs (not so much the cats, but they were cute too). 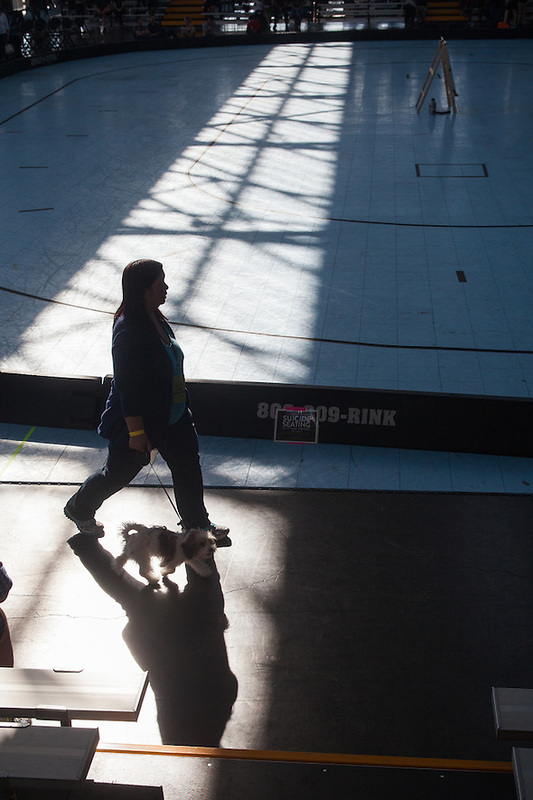 Each time I visited the booth, at least one derby fan was playing with the animals. Often, there was a line. 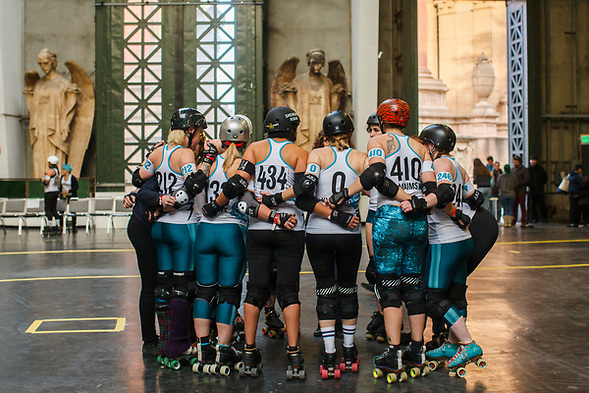 Earlier this month, the Bay Area Derby Girls All-Star team hosted the roller derby club from Montreal. 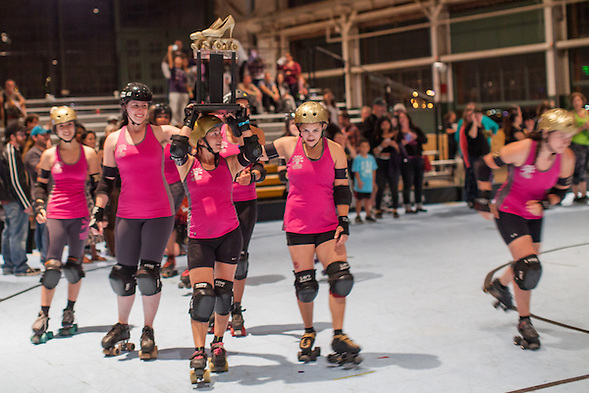 The Golden Girls defeated The New Skids on the Block 217-122 at the Oakland Convention Center. 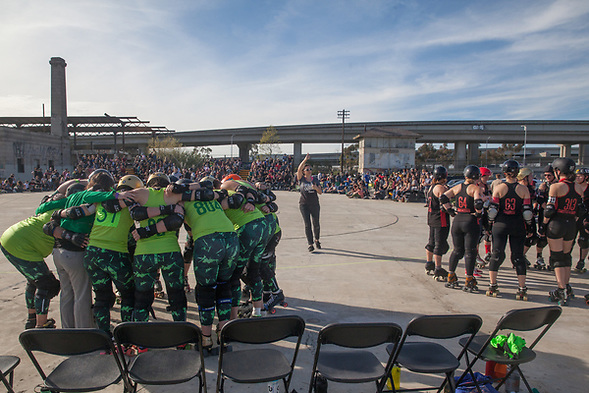 During half-time, Oakland’s Mayor Jean Quan proclaimed May 11, 2013 as “Bay Area Derby Girls Day” for the entire city. I have known Mayor Quan since she served on the school board (and later as my City Council Member). I have always been impressed with her visibility at community events. At derby, I was impressed by her ability to adapt. She pronounced the San Francisco ShEvil Dead’s name correctly. She asked questions and talked about her mother attending derby. 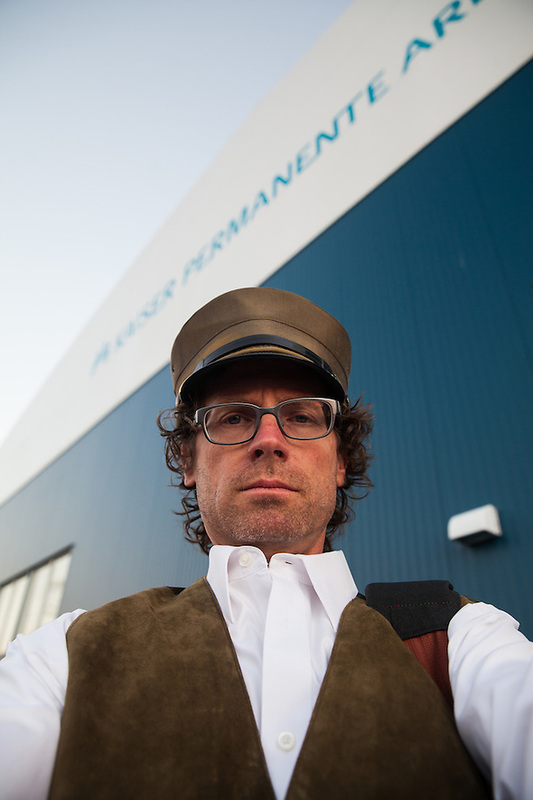 Last weekend, I took my new derby persona, P Giddy, on the road to Santa Cruz. I also took my family. We live about 2 hours from Santa Cruz, and my persona did not adjust until I walked into the new Kaiser Permanente without the kids … and Joan Jett’s Bad Reputation played. If P Giddy had a patron saint, it would be Joan Jett, though the Wilson sisters influenced his style guide. Women’s Flat Track Derby is many things to many people, but derby is more Afternoon D-Lightning than Starland Vocal Band. 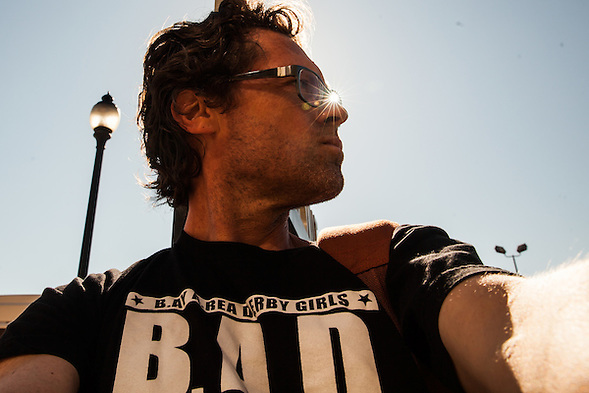 At it’s core, derby is Rock and Roll… and I love rock and roll. To prepare my children for their first bout, I showed my kids the I Love Rock N Roll video by Joan Jett and the Blackhearts. The video starts with Bad Reputation, so the kids learn TWO JOAN JETT SONGS.